On July 28, 1914, the belligerents began a struggle that would lead to battlefield deaths of almost 9,000,000 men and a total of 16 million people on three continents. 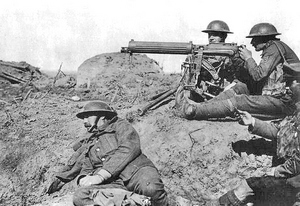 The primary cause of death was a new generation of World War 1 guns, big and small. Each side would be equipped with new age weaponry which would guaranty a lengthy conflict. Heretofore, these weapons had been trained on ill equipped tribesmen that insured quick victories for European armies. Lord Horatio Kitchener and his British army faced a charging horde of Sudanese cavalry in 1898. His arsenal of maxim guns decimated the enemy. The score for a morning's work was about 10,000 enemy dead and about 50 British soldiers were mortally wounded.. End of war! He would again lead his fellow Englishmen in 1914 as Secretary for War but would face an equally powerful enemy. Every infantryman was equipped with a bolt action rifle that provided mechanical reloading capability. The cartridge had also changed. No longer hand rolled, the munitions factories had produced a composite of bullet, propellant and primer. The smokeless propellant was now cordite instead of gun powder first introduced by the British in 1889. There was a clip with up to five cartridges to load the magazine. The bolt extracted the empty case from the chamber and it ejected it away from the rifle. The rate of fire was fifteen times faster per minute than the old musket subject to the minute time required to change the 5 round clip. The Lebel rifle was standard issue for the French infantry. Reported as slow to load and difficult to adjust sights, but with a large magazine capacity and 8mm round. The English Lee Enfield was manufactured by the Royal Small Arms Factory (Enfield, England) and named for the designer of its bolt action, James Paris Lee. The weapon was standard issue for the British and their Commonwealth countries as early as 1895. At that time, when compared with the German 8mm Mauser in the Second Boer War (1899-1902), its low muzzle velocity was problematic. The rifle featured a ten (10) round box .303 cartridge, top loaded. Although there were modifications to solve the velocity problem, a totally new design based on the Mauser was introduced in 1914 known as the British Pattern 14 Enfield, the predecessor of the American M1917. The Pattern 14 was a definitive improvement in accuracy and a boon for snipers. The drawback, if any, was its smaller five (5) rounds .30-06 cartridge box (later adapted by Remington Arms Co as .30 caliber). 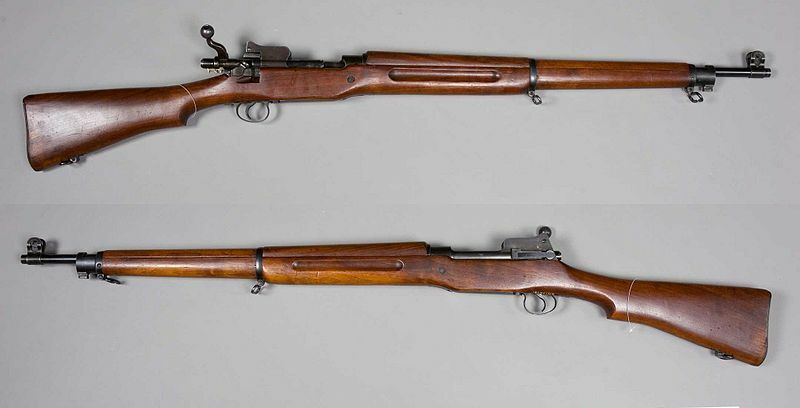 The heavier American Enfield, M1917 was not as sleek as its 1903 Springfield, but was manufactured in greater numbers than the standard issued Springfield; both were used effectively in America's 20 month war. These weapons were accurate up to 800 yards, and longer distances for the sniper rifles with telescopic sights. 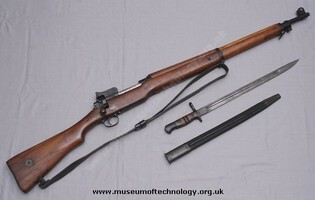 The bayonet was much used in the ubiquitous trench warfare. By the time United States entered the "Great War" (1917), they began issuing the 9 pound Enfield rifle caliber .30 compatible with the English ally's Pattern 14 Enfield with a slightly different caliber bullet (.303). 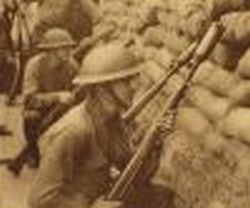 United States "doughboys" preparing to fire a grenade using M1917 rifle. The German Mauser created the standard for the bolt action rifle and was copied by the Americans in their 1903 Springfield. The Americans had learned about the Mauser's lethality in Cuba in the Spanish American War. Both weapons are still the iconic choice of sportsmen on the rifle range. The basic bolt action was invented by an Austrian almost 75 years earlier, but not until the eve of the 20th century were Germans able to perfect its mechanical action in 1898, and was known as the Mauser 8mm. The Versailles Treaty in 1919 permitted Germany to continue its manufacture in the shorter carbine model. This was a rapid fire gun, but not automatic. 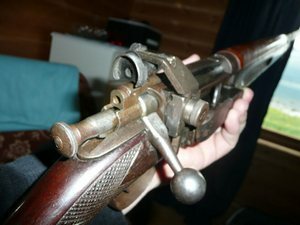 The former requires a separate trigger pull for each round fired. The advent of the armoured tank required counter measures. 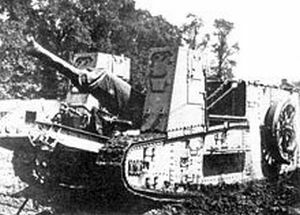 An artillery piece could pierce a tank and stop it, but the German infantryman was exposed to these metal giants and particularly the British Mark IV tank. Mauser's solution was the K bullet when loaded was using its current 8mm bullet chambered in reverse and added a stronger charge.The bullet had the best chance of penetrating the tank's shell if struck at a precise right angle. The gun was subject to overheating with the alteration creating a higher charge. This charge could damage the weapon as well as the shooter. Continuing to improve World War 1 guns, Mauser then introduced its 1918 Gewehr rifle with a larger caliber bullet (0.538"= 13.2492mm) and a stronger propellant. This operated as a single shot with bolt action rifle with armour piercing capability. The recoil was so strong that it often injured the shooter. A two man crew manned the gun. 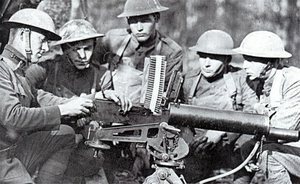 It was not until the appearance of the Browning machine gun late in 1918 , near war's end, that a true automatic anti tank weapon was placed in the hands of an infantry man. 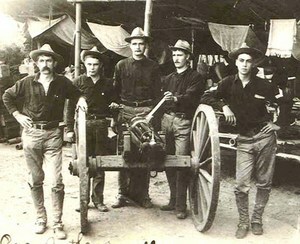 In 1898, during the Cuban campaign (Spanish American War), the then Colonel Teddy Roosevelt witnessed the deadly affect of a Gatling gun squad and credited its officer with the San Juan Heights victory stating "- - he had the rare good judgment and foresight to see the possibilities of the machine-guns". And Roosevelt had the "rare good judgment" to forecast the game changer that the presence of the machine gun would make on world war battlefields. The Gatling gun's rapid fire techniques required manual hand cranking to rotate its several gun barrels. In six years time, next generation technology had fully automated the machine gun as it made its appearance on the Chinese mainland in the Russo-Japanese War. The new 100 pound machine gun required a single trigger pull on a pistol grip as an ammunition belt automatically fed the bullets into the firing chamber of a single gun barrel eliminating hand cranking and significantly reduced the weight of the Gatling predecessor. The automatic,rapid firing gun with weights gradually reducing to as little as 25 pounds, when removed from its supporting tripod, was now highly mobile across battle spaces. It was now integrated with the movements of the infantry squad. The gun no longer was relegated for solely defensive purposes, to blunt an attack, but could now support an attack. The machine gun could fire up to 600 rounds per minute. The heat generated in the gun was air cooled which allowed for continuous firing. Overheating could fracture the gun barrel destroying the gun. The earliest 1900 models utlized water for cooling, but required a continuing source of water which was not always available on some battlefields.The air cooling technology was introduced by an American inventor, Lawrence Benet, who served as chief engineer of the Hotchkiss company. 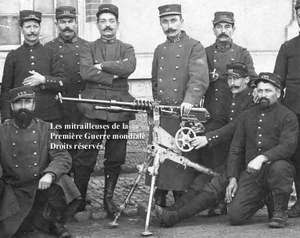 The French manufacturer, Hotchkiss et Cie, was in the forefront of this gun technology. Their Model 1914 was the state of the art that was still in use in World War II. Because of its heavy weight (over 50 pounds), it became a staple in planes and in their World War I Renault tanks . 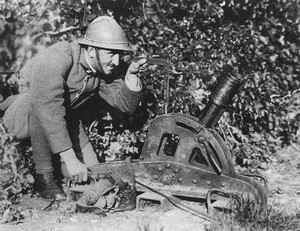 The French army had about 50,000 of these Hotchkiss weapons in operation during the war. The American Expeditionary Force (AEF) was allocated 7,000 of these guns in 1917. From the French prospective, the gun was chambered with the same 8mm round as their effective Lebel rifle (see photo above). The bullets were fed into the gun on a stiff metal strip containing 24 rounds. 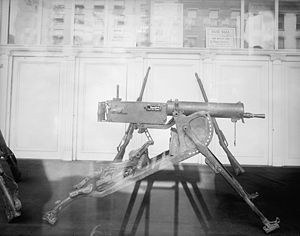 The British Vickers 1914 machine gun was also tripod mounted and fired 450 rounds per minute with the 0.303 bullet compatible with that used in their Lee Enfield rifle (see above). It had an effective range of 4500 yards. The 250 round ammunition belt was instrumental in deflating enemy attacks. The inevitable heat build-up was resolved by water cooling that was reusable by a condensation system. Each infantry battalion was equipped with a section of two guns. Their rate of fire was the equivalent of 40 riflemen.The British Vickers machine gun was also tripod mounted the bullet compatible with that used in their Lee Enfield rifle (see above). It had an effective range of 4500 yards. British manufacturers could barely keep up witt the demand for the gun. They were required to license its manufacture in the United States. 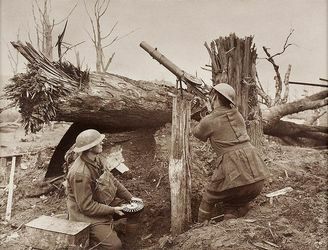 The British began to replace the gun on the Western Front with the much lighter Lewis gun (28 pounds) that fired 550 rounds per minute also using the 0.303 bullet. The gun was air coiled and operated on a gas principle that drove a piston to fire succeeding rounds. The design came from an original patent held by the American Samuel McClean. The weapon's versatile design was also added to the arsenal of the navy (ack-ack guns) and used against enemy aircraft over world War I battlefields. Because of its weight, the Spandau was largely an effective defensive weapon until it was removed from its tripod. Originally water cooled with a water filled jacket around the barrel, it had a range of 2500 yards and delivered about 300 rounds per minute. Each round generated a recoil that produced successive shots. At the height of the war, the Germans were manufacturing 1,400 per month. 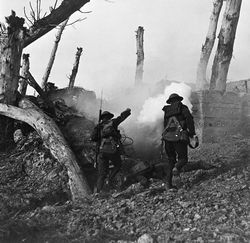 At the Second Battle of the Somme, August 8-November 1918, the American 27th and 30th divisions were attacking the German Hindenburg line. This defensive salient had been held by the Germans for almost 4 years. Their machine guns were devastating the attacking Americans who had been in the line for 26 days. They suffered over 11,000 casualties. Their major obstacle was the the 4-6 men machine gun teams that formed a defensive belt to protect their lines. In any measurement of the effect of power, the artillery must rank in the highest order. 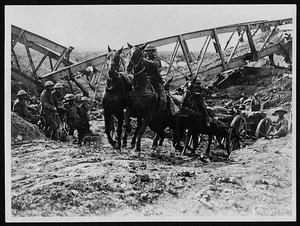 On April 9, 1917, the British commenced a five day bombardment of the German lines on the Western Front. This proceeded an attack along a 15 mile front. The sound and fury of the attack carried across the English Channel and could be heard as far away as the southern shores of England.The British Commander, Alexander Haig, noted in his diary: "Our success is already the largest obtained on this front in one day". Range finding to pin point the bombardment target had attained near historical accuracy. In earlier conflicts, artillery was utilized as a support for infantry, but as this war advanced, the big guns were integrated with the advances of the infantry. . Coordination with infantry advances made "creeping barrages" possible. Shelling would clear the front lines of the enemy as the infantry advanced under the umbrella of their own big guns. However, casualties due to friendly fire were an occasional consequence, and the new strategy permitted the artillery to set the time tables and the infantry to dance to the tunes of their big guns. The French had planned on firing 100,000 rounds per month That target was quickly eclipsed and shot up to 900,000. Shortages of artillery shells eliminated all prior estimates, and it became common for millions of rounds to be fired by each of the belligerents. When the United States entered the war in 1917, they had a total of 604 field guns, 209 heavy guns and a production capability of about 300 artillery pieced per month. Hardly sufficient for the 42 divisions it sent to war. The immediate problem was solved by shipments of steel to French factories to manufacture 75mm and 155mm guns .By the end of the war, the U.S. Army had over 3,000 guns mainly produced by France. The British Expeditionary Force possessed 3200 light guns, 3195 howitzers--a far cry from its 1914 arsenal of under 100 guns. On the other hand, by 1918, the Germans possessed 6,700 field guns and 12,000 artillery pieces---about 5 to 1 over the French forces. Field artillery, by definition, required maneuverability in counter distinction to coastal artillery or large guns fired from fixed positions. The former, a flatter but longer range. A separate category was reserved for the howitzer with a shorter barrel and a higher arc and steep descent. 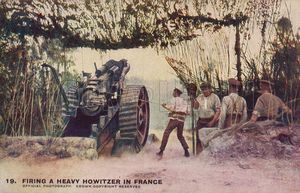 The howitzer was tailored for attacking the world war 1 trenches. Quick shifts from a fixed position were still in the horse and buggy era. Horse power and man power created the desired mobility with some limited engine power borrowed from the British Mark I tank. There were two types of artillery fire: direct--see the enemy and fire, or indirect--calibrate through an optical sight and choose an aiming point and then fire. In either case, the infantry became dependent on the artillery to clear the trenches of the enemy and to cut the barbed wire that stretched across the unoccupied no mans land between the enemies. Often the smaller guns, closer to the front, were pushed to the rear, by heavy enemy machine gun fire. Advances would halt when the friendly guns were out of enemy range, and then relied on the longer range of guns like the British Royal Marine 15" howitzer or the German Big Bertha. 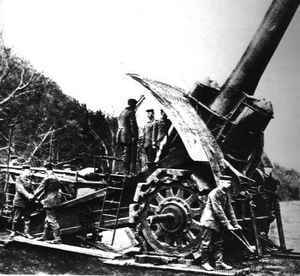 When big guns required to be moved, it was accomplished on rail tracks or broken in pieces and reassembled on site. The big guns fired several types of shells. There was the projectile that exploded on contact, but failed to reach into the desired zone of closely, adjacent trenches. This was handled by the high explosive shell that exploded over, or on, the enemy zone and sprayed its deadly shrapnel to all points of the compass. Then there were the shells that carried poison gas aimed at enemy artillery positions. There would be no blast damage, but the area was thoroughly contaminated. The German command commenced a new artillery strategy, ultimately copied by the allies. The new tactic, begun in the last year of the war, was a shortened preparatory barrage that froze and disoriented the enemy. Instead of an attempt to totally destroy, The short barrage was aimed at destroying morale and followed with a rapid and sudden attack. The element of surprise that had all but disappeared because of the lengthy barrage strategy, and an obvious harbinger of an attack, was replaced in an effort to change a four year stalemate. Germans seem to have understood the utility of a simple looking pipe that had limited range, but could project a small bomb into the air and fall straight down from its zenith onto the enemy. This weapon had, in its various reincarnations, been around for centuries. The Germans began to stockpile the weapon ("minenwerfer") before it launched the war in 1914. The British had no interest in the mortar, and their French ally, finally alerted to its significance, dug into an ancient stockpile used by Napoleon. In the trench war to follow, the mortar was an ideal weapon. 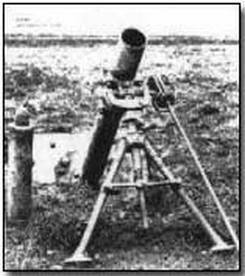 The Germans rapidly developed a small, medium and large (25 cm) rifled mortar. Accuracy was then insured. By 1915, the prime minister to be, David Lloyd George, lobbied against the military naysayers, and pushed for a mortar production program. 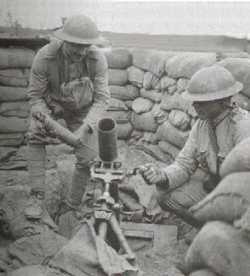 A British inventor designed a mortar that was the state of the art and still maintained simplicity. The Stokes mortar carried the name of the inventor. 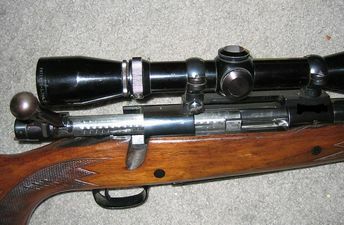 The smooth metal tube was mounted on a base designed to absorb the recoil that followed after firing. It afforded the small firing squad the ability to fire from the safety of a trench. The bomb was cast iron with a grenade fuse. It had a range of 1200 yards and could fire 22 times per minute. The design was shared with their French ally..
To review additional weapons on Land, Air or Sea World War 1 Weapons.